NOTE: This content is old - Published: Tuesday, Dec 4th, 2018. Merseyside Police say they have arrested two men following a pursuit of a Mercedes AMG which had been stolen from Connah’s Quay in June. The men were arrested following a pursuit of the suspected stolen vehicle in Kirkdale last night, Monday 3 December. The car collided with a fence following the brief pursuit at 8.50pm last night. 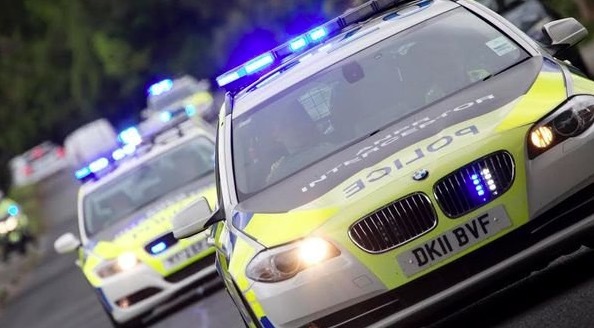 The two occupants reportedly ran off on foot and were detained in nearby waste ground by officers from Matrix Roads Policing, and dog section, with support from the National Police Air Service (NPAS) helicopter. “The car and various number plates were recovered for further enquiries. It is believed to have been stolen from Connahs Quay, North Wales in June. A 46-year-old man from Bootle and a 29-year-old man of no fixed abode were arrested on suspicion of burglary dwelling and taken to police stations for questioning. Anyone with information on burglary and vehicle crime is asked to contact the Merseyside Police social media desk @MerPolCC, call 101 or the independent charity @CrimestoppersUK anonymously, on 0800 555 111. Read 446,344 times in last 30 days.